31 March 2014 at Wingspace. Fitz Patton at right leads the discussion. On the table before him, copies of Chance Magazine issue 1. On the wall behind him, a draft of the cover of issue 3, Couture | Stage. Image by Martha Wade Steketee. Wingspace facilities at the Old American Can Factory Brooklyn provided the stage and Wingspace member Lee Savage welcomed about 40 engaged theatre designers and others on a cool end-of-March evening. The occasion — an informal discussion about and advance slide show of images from the 3rd issue of Chance Magazine. 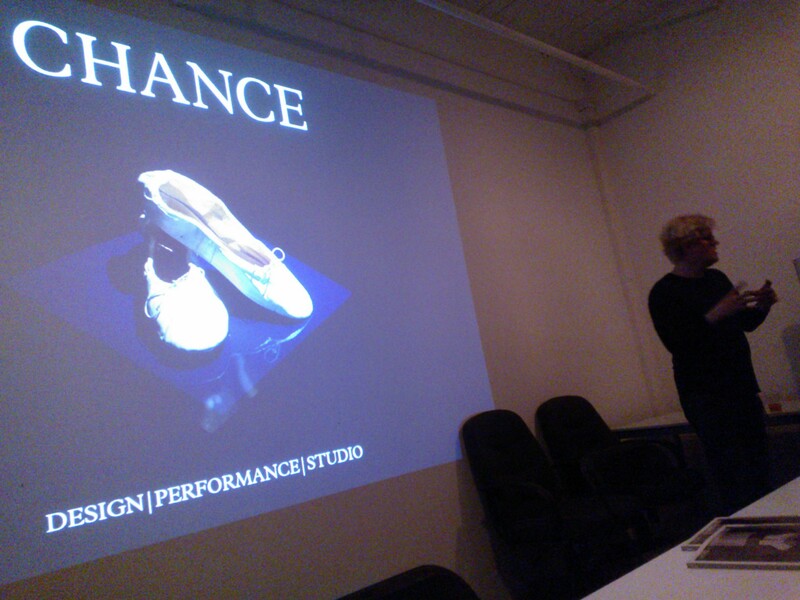 Fitz Patton, publisher and founder of the Magazine, led the conversation, shared fabulous slide show of images from the upcoming Chance that will focus many of its articles and essays and photo shoots on couture in stage design. In attendance were a range of Chance core team members who chimed in from time to time on areas of their involvement in the magazine: I spoke about the development of monograph sections on designers of past generations (Ben Edwards in issue 1, Boris Aronson in issue 2, and the Ming Cho Lee article in development for issue 3); Sean Cunningham outlined some recurrent editorial themes and how we’re constantly working to bring our magazine’s words up to the level of the images; Riley Teahan spoke on text and layout design; Nick Corda discussed his piece on New Brooklyn Theatre‘s site-specific production The Death of Bessie Smith; Jeff Hinchee talked us through his latest graphic design spread. The conversation was full, almost without pause for 90 minutes, and dense with concrete details + challenges + hope. Observations during the evening conversation. The crowd left with memories of large-scale images from Chance issues as published (issue 1 + issue 2) and as proposed (issue 3 + issue 4). Chance core team members and contributors left enthused by the conversation + the images + the mission + vision. All were reinforced by the recognition in the room that their efforts were worthwhile and also that they continue to seem important to the future of theatre design. And the community continues to grow. Thanks for sharing a fellow Dutch kid from Western Michigan’s musings on theatre. I stumbled on your blog yesterday while preparing for a class, and am charmed by what I’ve read so far. Lovely to meet in in this way, Leon! And thank you for the nice words.